I grew up with a family very into fantasy. And role-playing games. Playing D&D with my older brothers and dad, and countless computer RPG’s together. 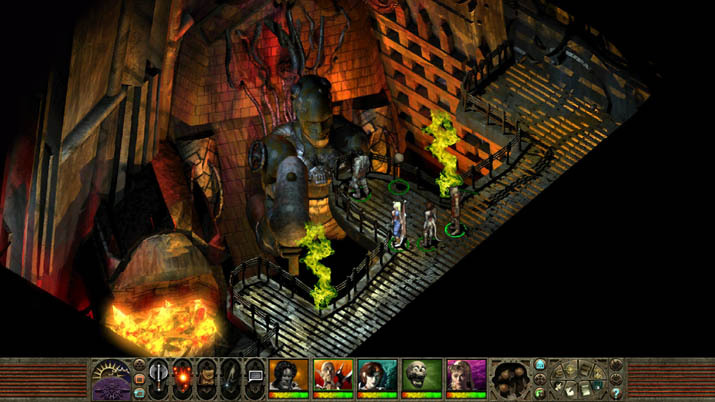 Many attempts have been made to recreate the Dungeons & Dragons (D&D) experience in an electronic setting, but few hit the mark as well as Planescape: Torment. Originally released by Black Isle Studios (the same developer behind Fallout: New Vegas), the game used a modified version of Bioware's Infinity Engine, the same engine behind the classic CRPGs of yore, such as Baldur's Gate. 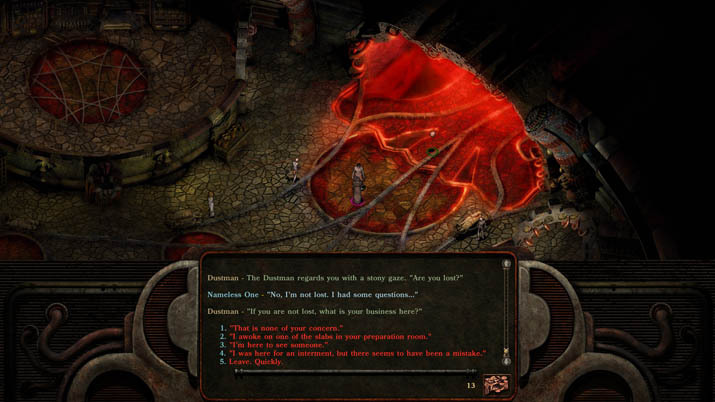 Recently, Beamdog remastered the title, similar to the other Infinity Engine games, and released Planescape: Torment: Enhanced Edition. The game takes place in the Planescape D&D setting, a delightfully retro world full of portals to other planes, worlds, and dimensions. Taking control of The Nameless One, a mysterious, unknown being, the player explores the environment around them, fights monsters, talks to NPCs, completes quests, and even travels worlds, all while learning more about their unknown past. The story is rich, the characters memorable, the gameplay immersive, and the overall experience great. First and foremost, Morte must be recognized as one of the greatest NPCs of all time. The wise-cracking skull is the first greeting into the game, and no matter what, you just can't seem to shake him. His snarky, sarcastic, comments make for well-need and much appreciated comedic timing, and a simply lovable, incredible character. Which, gives way to the characters in general. Each one has an intricate background and special features making them unique and diverse. All have individual drives, desires, and personalities, with a detailed, well-written background, giving you a sense of motives and opinions for the character. With such a large cast of such interesting faces, it truly pays off to speak to your party members and learn more about them over the course of the game, just as you learn about the protagonist. Originally developed in 1999, the Infinity Engine was based on the then-popular 2nd edition of AD&D. Featuring a mostly real-time experience, in combat, the player has free liberty to pause all actions, strategize, and issue commands to their party, pulling in a strategic component and a faithful replication of the tabletop game. Rather than taking control of a single character, you play as the entire party, taking everyone's turns, all while being able to stop and think about your next move. Furthermore, combat itself is even based on the tabletop combat rules. The engine randomly generates a random integer between 1 and 20, applies the character's relevant modifiers, and compares to the enemy's armor class. With smooth, tactical, and exciting combat, it's like playing D&D, with all the work done for you. This expands past combat, even in social encounters, several options are available, displaying different traits and behaviors, and even allowing certain social skill checks (i.e., Bluff, Intimidate, etc.) when applicable. While it is obviously impossible to truly capture the free nature of a D&D group, no other iteration of a D&D title has evoked such a similar feeling and come closer to the true tabletop experience; add a couple guys (one who always bails last minute), a pizza, and it's a regular game group. One of the many great features of Planescape is the variability and replayability. The Nameless One can be a Fighter, Thief, or Wizard, change the other party members, and react differently in social encounters. It is possible to play through with mostly story and conversation, or be a violent fiend. Stealthy rogue, or arcane wizard, noble protector or conniving weasel, the choice is yours, and can completely renew the title. In addition, the world is filled with various areas, with hidden, unforeseen treasures, interactions, and more, giving you a seemingly never-ending world, and a few extra, to explore. And while the game is great, it would be impossible if not for Beamdog. The graphic remastering is excellent, keeping the original style, but providing a much-needed graphic update, supporting even crisp 4K. The old, clunky, dirty sounds still retain their older charm, and mild unpolished appeal, but are much cleaner and well-mastered. In addition, the many bugs and failures which bogged down Planescape in the past have been removed, repaired, patched, and cleaned up, now offering a solid, fear-free state in which to run the game. Bringing back the original CRPG greats, making them available for the current and future generations, is a fantastic undertaking, and Beamdog's Enhanced content has done so beautifully, giving long-time fans faithful recreations of the titles they once loved, able to keep up with the modern day.